>My good friends Roger and Ilene are headed aboard their SAGA 43, a boat just like Pandora, to Tortola beginning this week to begin a winter of sailing in the islands. Actually, Ilene will fly to meet Roger there who will make the trip to Tortola with crew. However, the plan is for them to spend from November to May island hopping their way south and if they like island living, to leave the boat in Trinidad for the summer while they head north and home for a few months prior to heading back for another winter season in the islands. I have a number of friends that do this and it sounds like great fun. Roger has spent months getting his boat ready to participate in a cruising rally from Hampton VA to Tortola. This rally is a big one with some 75 boats that will head south together. Participating in a rally is a great way to get started with ocean sailing as it allows access to a weather router and other safety services and know how that most wouldn’t have access to as easily. You can follow their progress on the rally site. 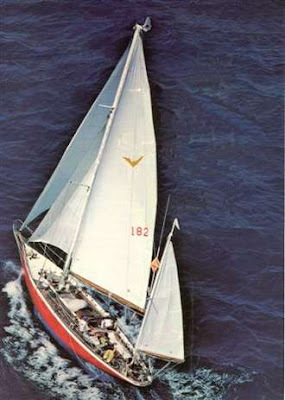 This link shows all the classes and this one class 6 which is what Roger and Ilene’s boat Ilene is in. The tracker shows that everyone is still in Hampton but they will likely leave soon so keep checking the site regularly. At this point the key issue is to get a good weather window to begin the trip. The group, The Cruising Rally Association, that organizes this rally also has other events including Bahamas and an Atlantic crossing rally. Their site is quite interesting as you can follow the boats as they make their way south. Each boat is fitted with a GPS tracker that “pings” a satellite with their speed, direction and location about ever 15 minutes. . I want to go sailing and all I can do is write about it now that Pandora is on the hard. Bummer about that. I can’t wait till May when she goes in the water again. There’s not much to report about Pandora right now except to say that she is in a boat yard in Norwalk CT and I am getting started on getting upgrades underway and her ready for the freezing weather that’s on the way. It’s hard to find interesting ideas for posts when Pandora isn’t in the water but I will do what I can to keep to a weekly schedule. Yesterday I began getting the frame fitted to hold her canvas cover that will keep water and ice off of the decks. I don’t get many comments on my posts and yet see that I am getting visitors. Who’s out there? Leave a comment, please and tell me what you think. For as long as I have been sailing I have dreamed of a day when I can head out aboard my boat with no set schedule and go somewhere warm with clear warm waters. Or at least not head home after two weeks of aboard. While heading into the sunset without a care in the world hasn’t been possible yet, I do feel like the dream is getting a bit closer and Pandora is closer to being ready. Unfortunately, Pandora is now out of the water for the season as I wasn’t able to take the time to run her to Annapolis as was my plan. Due to business obligations, she had to come out and is now in Norwalk CT until she is launched in the spring. Bummer about that. Now that she is “on the hard” I can begin focusing on needed upgrades in preparation for more time aboard. With this in mind, last weekend Brenda and I visited the Annapolis Boat show, in what has become a yearly ritual for us in early October. This year was no different and I looked forward to the trip with as much anticipation as ever. When we purchased Pandora back in 2007, the plan was to do upgrades each year in anticipation for the day when we would be able to more time aboard. While the actual year and date of our “big departure” remains unclear, in part thanks to the recession, I do feel that things are beginning to come together. To spend months at a time aboard means that a boat has to be outfitted with more gear than would normally be the case for boats that are used for weekend trips and the occasional week long family vacation. This last summer, even though I still work full time, saw me and Brenda aboard for more time than ever. Last winter was spent being sure that Pandora was set up for “work”. This meant that I had to be sure that I was able to make the most out of sometimes weak cell coverage and could be always connected with work and my partner. When I left my position of 17 years at the beginning of 2009, I was committed to building something new and yet having the freedom to work wherever I happened to be at the time. My partner and I started a company working with medical societies developing educational programs in early 2010. Fortunately, working aboard has been going fairly well as I am very disciplined and each day I was up, dressed and ready to go by 8am, just like when I was going to an office in my previous life. However, this summer was very different, as I was aboard and not in an office building somewhere. With today’s remarkable technology, you can be nearly anywhere and nobody can tell. I once saw a cartoon showing a dog sitting at a keyboard and the caption said “on the Web, no one knows you are a dog”. That’s true and unless the wind is howling, it’s impossible to say exactly where someone is these days when they are on the phone. In any event, my goal has been to set up Pandora as an office and with lots of preparation and hard work, it has worked out well. The only major problem that I ran into was discovering that my cell booster could only provide the needed boost when the signal was fairly good to begin with. Unfortunately, and much to my dismay, the further Down East you get in Maine, the crummier the signal becomes. While I was often able to make good clear cell calls, getting decent data coverage was a different story. A call to Verizon uncovered the fact that the cell systems in the more remote regions of the Maine coast are older and not up to the task of moving lots of Web data. Well, you live and learn. However, for the entire time we were in Maine there was only one day where the Web, slow or not, proved to be impossible to work with. Not bad for my first attempt at a floating office. Enough about last summer. Many of the first important steps in getting Pandora ready for really serious cruising are now done and this visit to Annapolis and “the show” were to settle several important remaining equipment needs. My VHF, short range radio, is woefully out of date so I am very much in need of a replacement. 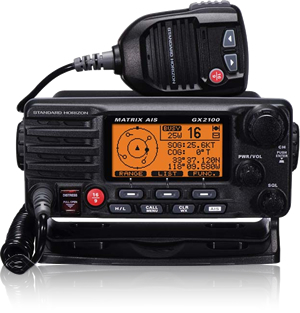 The VHF aboard is probably over ten years old and lacks many new and important features. First , all current radios have DSC, or digital selective calling. While not mandatory on boats under 300 gross tons, this feature, now required on all new VHF units, allows the radio be wired into a GPS so that, in the event of an emergency, it allows for a signal, with location cordinates, to be broadcast in the event of an emergency. This is not unlike my EPIRB, Emergency Position Indicating Radio Beacon, which will transmit a signal to a satellite, when activated, anywhere in the world. DSC is similar but only works on a short distance basis. Anyone that really knows the ins and outs of DSC will say that I am leaving out important details but it’s still new to me. There is another, and even more amazing , technology that is being quickly adopted by yachts today and that’s AIS, This technology, as I understand it, is very similar to the system used by air traffic control to keep track of airplanes. With AIS, each ship over a certain size is required to have an AIS on board to continually transmit the name of the ship, location, course and heading as well as other important information. The VHF radio that I purchased also includes an AIS receiver so I can monitor shipping nearby. The unit is made by Horizon Standard and I am told is the only unit on the market today that has this option built in. While radar helps in seeing ships when they get close, It’s much better to have the name of the ship and all sorts of other information show up on the radio and incredibly, on the screen of my chart plotter. Very cool indeed. There have been many times over the years when I have seen ships at night, tried to hail them and not gotten a response. Perhaps it’s because I would say something like… “vessel headed east out of the Race, this is the sailing vessel Pandora. Come in please”. This always seemed clear to me but often there was silence on the other end. I am told that when you call a ship by name you nearly always get a response. AIS makes knowing the name a cinch. I am looking forward to learning this first hand. Unfortunately, my new unit is only a receiver. Ideally, I’d like to have a transmitting AIS so that these ships would see me on their screen too, but it’s not in the budget this year. While It’s not ideal, this system is a major move forward for Pandora. Also on my list for several years has been a proper offshore life raft. 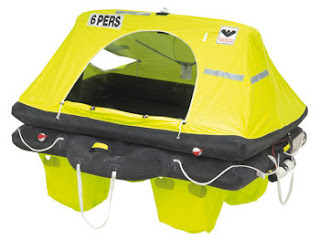 Since much of my cruising is in the cold waters of Maine, where a visit overboard in water in the high 50s would mean death from hypothermia in a very short time, having a proper raft was a key missing piece of safety gear. With my CT to Maine runs and my yearly trips to Annapolis, I am putting more and more offshore miles on Pandora so it’s high time that I added a life raft to my safety equipment list. After looking at all of the major manufacturers, I settled on a four man offshore raft from Viking. This company supplies the cruise lines, military and other commercial ships and, in my opinion, is a raft that offers excellent value for the money. This raft is built for tough conditions and is designed for cold weather use as well. Let’s hope that I never learn first hand how the raft performs. While we also have a perfectly serviceable inflatable tender or dink, I have wanted to upgrade to a hard bottom model for some time. Our current tender, that we have had for years, is great but with the soft bottom, getting the boat up on a plane with both of us aboard has been a problem. It really goes with just me aboard but with me and Brenda, it just can’t make the “jump to warp speed” and allow us to cover more ground quickly. This is especially important when we are in a larger harbor with distance to cover and is particularly helpful when the water is choppy. Any soft bottom dink is fairly wet when the going gets rough and heavens, it just wouldn’t be right to head out for a night on the town in a wet dink, would it? While those three purchases are probably enough for now, the one remaining major item on the list for this winter is to upgrade the cooler to a proper deep freezer, fridge combination. While I talked to all the vendors at the show as well as a number of my friends who are educated on the topic, I am now even more confused than ever. There’s much more to learn before I make a decision so perhaps I’ll leave that discussion for a future post. However, the goal is to have a freezer that’s cold enough to keep a good amount of food frozen verses the pint size freezer compartment that we currently have. Speaking of “pint”, it would also be wonderful if we could keep ice cream. Now, that would be quite a treat. Finally, while we were at the show we had dinner with 15 of our closest friends, a group of fellow SAGA owners who met up at a local eatery to share stories and argue over the relative merits of equipment choices. It was at that dinner that I became even more thoroughly confused about the proper equipment for fitting out a proper freezer. The problem is that the solution can cost from a very affordable $125 to over $2,300 or more depending on the approach I were to take. At the dinner the one who owner that had traveled the furthest in a SAGA had made the trip to Annapolis all of the way from Guatemala where she, Ursula actually, had made her home aboard her SAGA for the last few years as she traveled around the Caribbean.. However, the highlight of the night for me was that Don Street, the godfather of Caribbean cruising who traveled from island to island for over 50 years aboard his 105 year old yawl Iolarie. He has written countless magazine articles and has authored a number of vital cruising guides for the area. What good fortune it was that he happens to be a good friend of a fellow SAGA owner. I was just thrilled, that the legendary Don Street was to join us for dinner. And to make it even better, If there was ever anyone that looked the part of the “salty sailor”, Don’s the guy. In his 80s, he’s just as interesting as always. While he has recently begun to slow down and has sold his beloved Iolarie, he told me that he plans on continuing cruise as much as he is able to. However, he will be doing so now in the time honored OPB (other people’s boats) sailing tradition. I only wish that I had an opportunity to spend more time with him. While the evening was short, I did get this great picture of him. Guess who’s Don? No, that’s not him in the middle. It’s me. There’s so much to write about but I don’t want to drone on forever. Perhaps that’s enough for now.